Millennials, move over. It’s time for Gen Z. And with spring break approaching, it’s a great opportunity to focus your marketing on this young, hip and digitally savvy audience. Generation Z, loosely defined as those born after 1995, is soon to become the largest generation ever, currently comprising 25% of the US population. In the US, some 20 million attend college and are about to experience some hard-earned time off for the semester. But make no mistake – the “spring break” phenomenon is much more than a mere mid-term study break for students. Rather, for young adult consumers, it’s a national excuse to party. The first fundamental rule of marketing is this: Know your audience. During spring break, the target audience has a one-track mind – fun, fun, and more fun. This means local and international vacays, as well as lots of pool and beach parties. There’s a strong emphasis on everything e-commerce surrounding all this, from flights and transportation to hotels, hospitality, food and beverages, party goods and services, apparel, beach accessories, you name it. 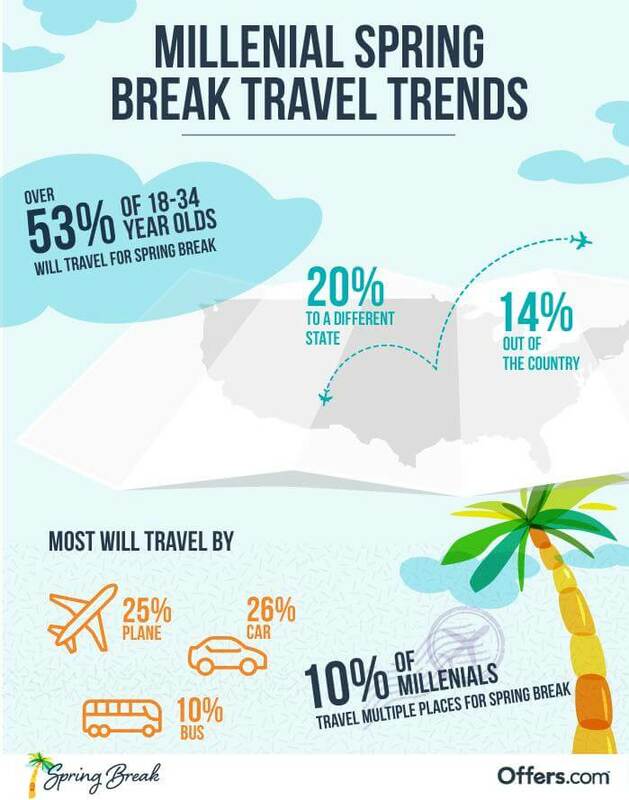 Last year, 53% of 18-34-year-olds were planning to travel during spring break, with the average spend for the vacation period hovering around $370 per person. For brands and advertisers in a wide range of consumer categories, spring break is an opportunity to capture an audience with intent to spend, so don’t miss out! Gen Z is often referred to as “digital natives” – the first generation to have spent their entire lives with complete access to the internet and smartphones. Gen Z’ers are plugged in approximately 10 hours a day, with teens in this group spending at least 3 hours a day on their smartphones. But for advertisers, it’s not just a matter of being in the digital space. You’ve got to go a step further in order to really capture attention. According to a report by Google, Generation Z wants more personalized online shopping experiences, which means that advertisers need to get personal when it comes to consumer habits and preferences. For brands focusing on Gen Z, targeting tools are a really important component of any good advertising campaign. With Outbrain interest targeting, for example, advertisers can focus native ad campaigns on people whose interests truly match their product or service. Although Gen Z is the most active generation on social media, the fact still remains: what people like and share on social is not the same as what they are actually reading. So, it’s important to use all of the tools at your disposal to get past the noise and to focus your campaigns on Gen Z’ers who are more likely to convert. Forget passive TV watching – Gen Z is a highly proactive and visual generation. Interacting with screens is their second nature. They are the first generation who learned to swipe before they could walk. Those who make up Generation Z are accustomed to having choices: they shift constantly between their smartphone, TV, and laptop. They’re also a gaming generation, with 66% of males and 50% of females stating they play games on their smartphones. Traditional ads won’t do. Advertisers must tap into the interactive spirit of Gen Z by engaging them with playful content. Games, quizzes, surveys, competitions, and incentivization are all ways you can boost engagement levels. Capitalize on the party vibe of the spring break season with fun, interactive ads that drive conversions. If you thought young consumers just love to spend, spend, spend, think again! Gen Z is shaping up to be a financially savvy and aware generation who enjoy a bargain. Unlike Gen Y, who love to pay for ‘experiences,’ Gen Z are more practical – they prefer a cool product (60%) to a cool experience (40%). According to this IBM report, Gen Z is an entrepreneurial lot, with 28% of 19-21-year-olds making money online. What’s more, the same report found that Gen Z’ers of all ages have a huge influence on their family’s spending, no doubt due to their deeper understanding of online shopping. It seems only natural that Gen Z is looking for real value in exchange for their money. In fact, 65% of Gen Z members enjoy receiving discounts, coupons, and special offers, so make sure to include these in your spring break native ad campaigns. If your target audience extends beyond Gen Z’ers, don’t worry, the spring break season brings other opportunities to boost your ad campaigns. Spring is US tax season, and for many consumers, March and April are when their annual tax refund arrives. And this means there’s an extra cash bonus to spend. So, be sure to combine your spring break campaigns with other discounts and incentives for tax season, targeted to the relevant audience. This way, you can go beyond the younger Gen Z consumer and reach even more potential customers. Stay on topic: For brands or retailers in travel, hospitality, and associated consumer goods, make sure not to miss spring break advertising opportunities. Focus on Gen Z: Spring break is all about youth. Adjust your messaging and targeting accordingly. Play it young: Gen Z loves interactive content like quizzes and games, so be sure to include them in your spring break campaigns. Offer discounts: Gen Z is a financially savvy generation and they appreciate a good discount or special offer. So give it to them! Expand your reach: In the US, spring is also tax season. Leverage this in your ad campaigns and you can go beyond the Gen Z audience. Spring break? Time to party!